The centrality of water is a recurring theme in various religions. The Bible — largely written amid water scarcity — associates drought with the wrath of God. “By means of water,” says the Quran, “we give life to everything.” Hindu gods and goddesses related to water are tied to fertility or to new beginnings. Asia, the world’s driest continent per capita, symbolizes the paradox of water: a giver of life that can also be a destroyer when it becomes a carrier of deadly microbes or takes the form of a flood. 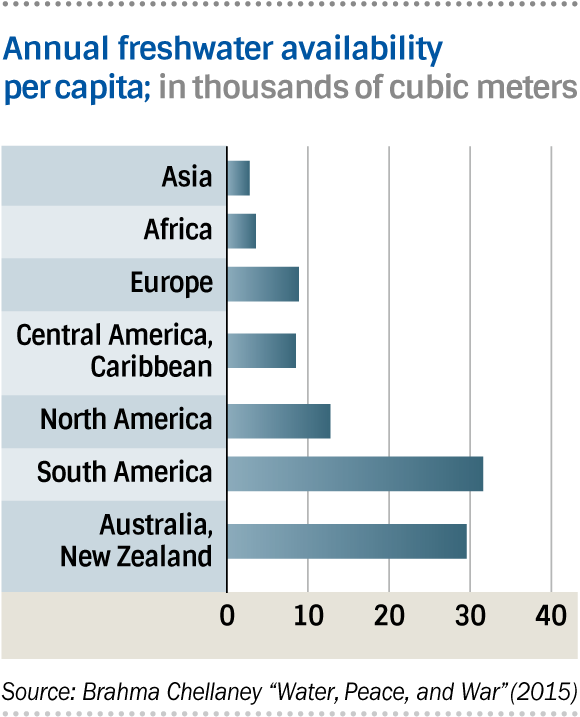 Asia struggles with water problems of almost every kind. The region’s biggest natural disasters this century have been water-related: The tsunami that struck Japan’s northeastern coast in 2011 caused a triple nuclear meltdown at the Fukushima Daiichi nuclear plant, and the 2004 Indian Ocean tsunami left behind a huge swath of death and destruction. Flooding this summer has caused fatalities and widespread damage in parts of southern China and eastern India, and a serious drought is ravaging countries as disparate as North Korea, Thailand and Vietnam. Contaminated water, meanwhile, continues to be a major problem across much of Asia, which has some of the world’s worst water pollution. Unfortunately for Asia, these problems are set to become even worse. Global warming and El Nino — a warm, irregularly occurring current in the Pacific Ocean that can cause significant changes in temperature and rainfall — are triggering more frequent droughts and flooding, especially in the summer monsoon season. El Nino events occur at unpredictable times, sometimes more than five years apart. 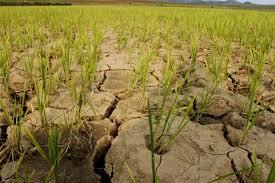 The current El Nino threatens to inflict serious economic damage in South and Southeast Asia. The agriculture sector, the leading employer in many countries, is particularly vulnerable. According to a Citigroup report, prolonged drought and the resultant crop losses could lead to higher food prices in several Asian nations. Over the longer term, freshwater supplies are likely to come under increasing strain as oceans rise and the intensity and frequency of storms and other extreme weather events increases. Cycles of severe flooding and drought brought on by climate change will render the availability of potable water even more uncertain. This could exact significant human and economic costs, especially in financially strapped countries such as densely populated Bangladesh — the world’s seventh- most populous nation. North Korea says an unparalleled drought is currently exacerbating its food crisis. Pyongyang, having learned from a famine in the late 1990s that killed at least 600,000 people, has improved its agricultural management and set aside stockpiles of food, putting it in a somewhat better position to deal with the latest drought. But because copious amounts of water are needed for energy extraction, processing and production, North Korea’s severe water shortages have hit electricity generation, leading to frequent blackouts. In much of Southeast Asia, parched conditions and above-average temperatures have forced farmers to leave their fields fallow. A prolonged drought has affected all five provinces in Vietnam’s coffee- producing Central Highlands. As a result, the country’s coffee exports have dropped 40% compared with last year. In Thailand, the government has unveiled a $1.77 billion aid package for farmers affected by drought. About 1 million farmers have received loans so far. The drought is concentrated in seven of the country’s 67 provinces, but its wider impact on rivers and lakes has prompted water rationing in nearly a third of the country. Drought conditions have also affected rice cultivation in parts of neighboring Laos and Cambodia, where some water sources have dried up, though a partial rebound in rainfall in July has brought respite to some drought-stricken regions. At the opposite extreme, heavy flooding this year has affected up to 4 million people in China, while torrential monsoon downpours displaced many in eastern India. Australia’s extremes of drought and flooding, which seesaw with the cycles of El Nino and its cold-current counterpart La Nina, should serve as a warning for Asia. The country’s longest drought in more than a century lasted from 1996 until 2010 (even longer in some areas) and was followed by serious flooding in 2010 and 2011. Global warming threatens to increase morbidity and mortality. As floods and droughts become more severe and runoff patterns shift, variations in Asia’s hydrological cycle — the sequence of precipitation, evaporation and transpiration — are set to grow. This could threaten food production in some countries, unless crop varieties emerge that are more drought- and flood-resistant. The accelerated melting of snow in mountain ranges and faster thawing of glaciers in the Tibetan Plateau and the Himalayas will likely trigger serious flooding in downstream countries in the warm months, followed by an irreversible depletion of river flows. tactics. Villagers in some parts of South and Central Asia now hire private security guards to protect their wells, tanks and ponds from water thieves. In these parched areas, water has become a precious resource worth fighting for. also be forced into cities and other areas with relatively better water availability. Overexploitation of coastal aquifers, meanwhile, allows seawater to intrude and replace the lost freshwater. The failure of governments to check deforestation and the depletion of swamps — important natural water absorption and storage systems — contributes to cycles of chronic flooding and drought and spurs the desertification of grasslands. Asian countries must enhance their water infrastructure to increase distribution efficiency and mitigate imbalances in water availability. Storing water in the wet season for release in the dry is one way to ease seasonal imbalance. 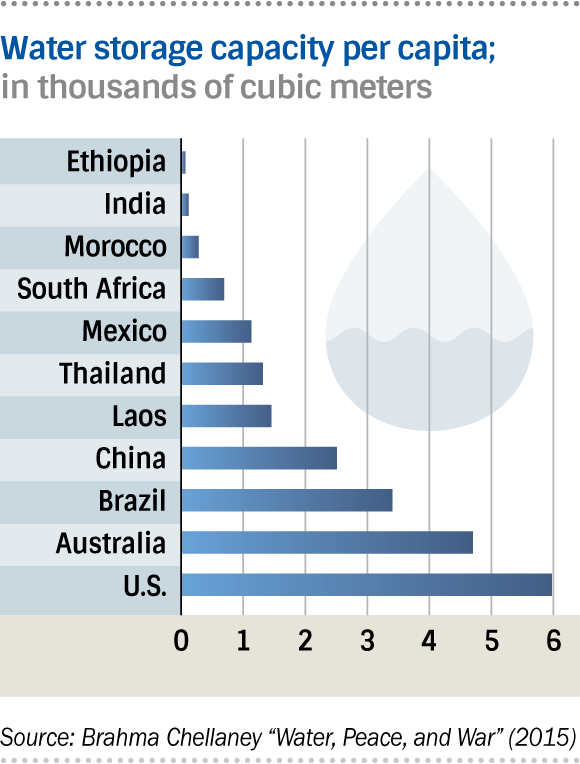 But most nations in Asia, with the exception of dam-dotted China, have a relatively low per capita water storage capacity by global standards. Because warmer air carries more moisture, the increase in average temperatures has helped to raise global rainfall, especially in the tropics. Asia’s monsoons are projected to strengthen further. To compensate for decreased river flows, rainwater capture on a large but environmentally sustainable scale will likely be critical. Rainwater harvesting is, in fact, an ancient and relatively low-cost technique invented in Asia. Its revival in cities ranging from Singapore to the southern Indian metropolises of Bangalore and Chennai makes it one of the most promising frontiers in the battle to ease local water shortages. Water stress is often accompanied by a fall in water quality. But when water quality is maintained, the impact of water scarcity can be better managed. If the region’s water-stressed economies are to raise their water productivity levels, they must begin by increasing their water quality. Asia needs new market mechanisms, public-private partnerships, innovative practices, conservation and astute water management to advance affordable solutions. Increasing the diversity of water supply for agriculture and energy should be a key goal of improved water management. The power sector’s role in contributing to water stress, for example, could be curtailed by utilizing non-freshwater sources — including seawater, impaired groundwater and recycled water — for cooling. The close nexus between water, energy and food demands that these three critical resources be integrated into national policy frameworks to promote synergistic approaches. Asian governments cannot afford to waste time to address their pressing resource and environmental challenges. Brahma Chellaney, a geostrategist and author of “Water: Asia’s New Battleground,” is currently a Richard von Weizsaecker fellow at the Robert Bosch Academy in Berlin. © Nikkie Asian Review, 2015.